Despite examples of success that are almost miracles, there are powerful enemies of charter schools who are trying to kill them at every turn. Charter schools have been able to take students from the worst inner city areas who most likely would have ended up drop-outs, pregnant, in youth detention, or dead if they had stayed in regular public schools and instead tuned them into high school graduates who are going to college. Despite proof that charters work, there are those who are committed to protecting the status quo. There are those who see charters as a threat to racial diversity plans and are more concerned with the integrity of mathematical diversity ratios than educational excellence. There are also those so committed to the role of the teachers union, that all they can see in charters is a threat to unionism. The narrative of opponents of charters is that charters increase cost to the school system by diverting money to charters out of regular schools. When a charter is established the money for the education of a child attended a charter goes to the charter school. Opponents of charter schools argue that taking a child out of a regular classroom does not cut overhead. If having fewer students to educate should not reduce overhead that is not an indication of charters being costly to regular pubic schools but an indication of a bloated bureaucracy and mismanagement. Councilman Steve Clover, chairman of the Council's Education Committee is a critic of charter schools. 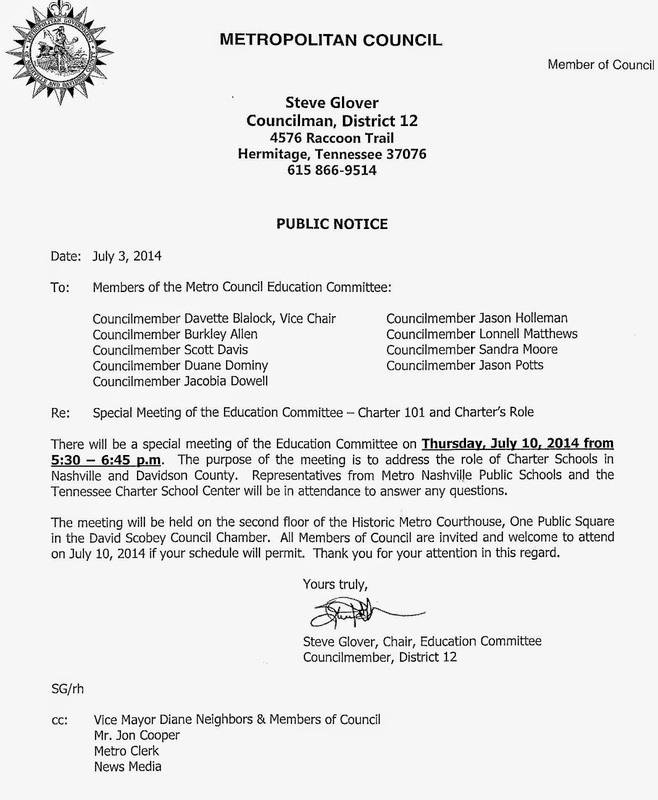 There is not a vocal advocate for charter schools on the Council. Sometimes the mere presence of people with a particular point of view in the audience can change the dynamics of a public meeting. While this is not a public hearing, supporters of school choice would be wise to attend this meeting and be cognizant of what our elected officials or doing in regards to education reform.